Orange Group comprises Thirumala Cabs, Orange Tours & Travels, Orange Cargo Carriers and Orange Road lines. Thirumala Cabs is the Parent Company and rendering services to many corporate clients viz: Wipro, Nokia, Ericcison India Pvt Ltd, Reliance JIO, Idea Cellular ltd, Samsung, HFCL, Indus Towers,Tata, Huawei, GMR etc. 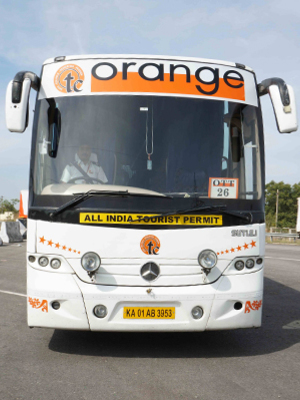 Orange Tours & Travels was commissioned in July, 2011 in Hyderabad. The first service was started from Bangalore to Hyderabad (Semi-Sleeper) on 7.7.2011 with Mercedes Benz vehicle. And subsequently Spread its Operations, gradually in due course, to various cities/towns of southern India such as Chennai, Mumbai, Nagpur, Pune, Coimbatore, Cochin, Madurai, Mangalore, Pondicherry, Vellore, Vishakapatnam, Vijayawada, Guntur, Tenali, Vijayanagaram, Chirala, Eluru, Tuni, Yanam, Goa, Shiridi, Kolhapur, Thirupathi, Adilabad, Nizamabad, Karimnagar, Warangal etc., from Hyderabad, and also covering many Intra & Inter State Services in and between the States of Andhra Pradesh, Karnataka, Maharashtra, Tamilnadu, Kerala, Goa and Telangana. 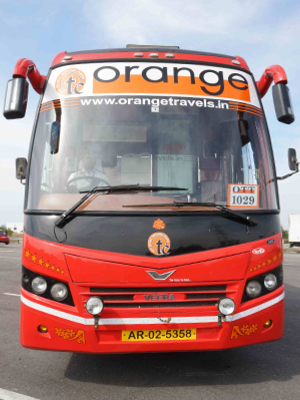 The turnover of Orange Travels is Rs.300/- Crs. (Three hundered crores) per annum in 6 years span from the intial years Rs.20/-Crs (Twenty crores). Orange Travels organizes Centralized Call Centres in Hyderabad and other States also round the clock to respond and redress the grievances/problems, if any, of the customers. Complaints and feedback from each passenger are obtained after the spell of journey on the next day and addressed on priority and compliance is also reported. We have our own Hub established in 2011 in Hyderabad for maintenance of vehicles. We are proud to declare that we have grabbed the following All India level best Awards for the year 2016. India’s Favorite Bus Service Award from Holiday IQ-March 2016 at New Delhi. India’s Best Driver in Private Sector (Mr.T.Srinivas) from India Bus Awards Organization-July 2016 at Goa. Best Bus Fleet Operator in private Sector in India’ as adjudged by the Jury of Apollo- CV Awards,2016. Best Operator for Passenger First Initiatve in Private Sector (Pan India) from India Bus Awards Organization-July 2017 at Mumbai. Excellence in Employee Welfare in Private Sector (Pan India) from India Bus Awards Organization-July 2017 at Mumbai. India's Best Bus Driver Award ( M V Rami Reddy) in Private sector (Pan India) from India Bus Awards Organization-July 2017 at Mumbai. 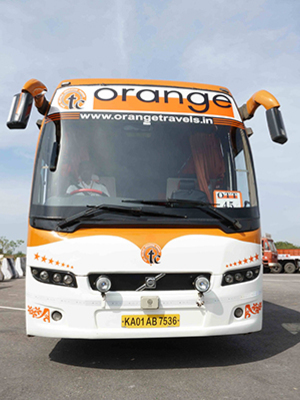 Orange Cargo Carries was started in Hyderabad with effect from 11.11.2011 with 80 trucks and co-ordinate support-link of passengers transport buses of Orange Travels. Corporate clients and as well the medium and small business-communities are covered by us. The annual turnover of business is 24 Crs. For the convenience of customers and concurrent coverage of business 153 branches are established and 135 Authorized Agents are deployed all over India. Centralized Call Center in Hyderabad is run to register and rectify the delays and lapses in delivery and to address complaints of customers promptly. Recently, an attractive scheme called ‘’Overnight Service’’ has been introduced in order to transport the cargo booked in the night of the same day and deliver on the next day to the consignee. Luggage of less than 25 kgs, and small parcels, covers, packs etc. are only accepted and allowed on certain prescribed routes/sectors. We provide customized logistic solutions to our esteemed clients with fast, prompt, regular and reliable service so as to make safe, secured and on time delivery, up to their utmost satisfaction. Orange Road-lines was incepted on 1.9.2015 with 13 containers and 16 lorries in Hyderabad. We arrange on time and safe delivery of booked goods. At present there are 15 containers 46 lorries under operation in our company. Our service is spread over to the States of Telangana, Andhra Pradesh, Gujarat and Delhi. Present annual turnover is Rs.21 Crs. Vehicles of Road-Lines are also maintained at the common garage in Hyderabad. Vehicle- tracking system, with integration to GPS, is available in respect of the vehicles of Orange Travels, Cargo Carries and Road Lines, to know the exact location of the vehicle at any time after dispatch and up to the arrival at the destination, for the confirmation and satisfaction of the customers.